Over 300 youths from Agege, Alimosho and Ikeja are expected to gather in Alimosho area of Lagos, Southwest Nigeria on Sunday for the Independence Day Gospel mega jam concert. 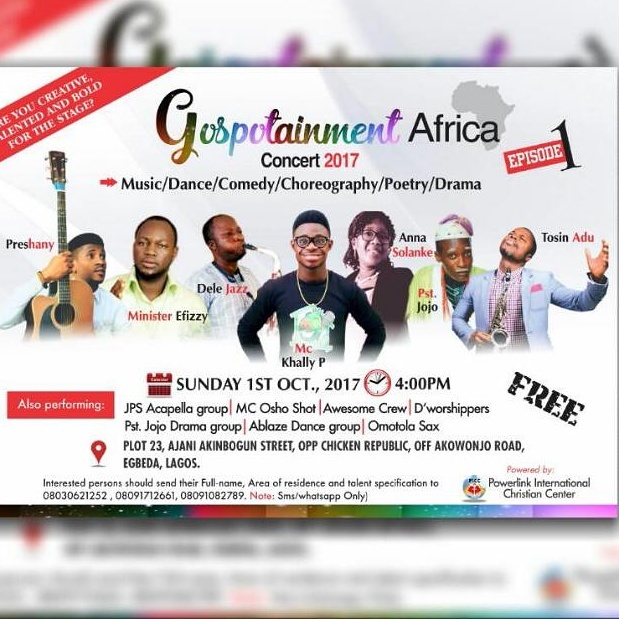 The concert, tagged: “Gospotainment Africa Concert 2017” will hold at Plot 23, Ajani Akinbogun Str, Opposite Chicken Republic, off Akowonjo Road, Egbeda, Lagos. The musical concert is being organized by Powerlink International Christian Centre, PICCI and is meant to showcase young Christian talents in music. Senior Pastor, PICC, James Adeyemi said an ash tag #GospoTAINment_2017 has been created for the concert. “Here comes a platform provider for youths/young adults who have dynamic inbuilt potentials in music, dance, comedy, choreography, poetry and several others,” he said. This year’s edition which is the 1st edition will be featuring Preshany, Minister Effizey, Dele Jazz, Khally P, Anna Solanke, Pastor Jojo dance drama, Tosin Adu, De Invincibles, JPS Acapella group, Awesome Crew and Ablaze dance crew. According to Adeyemi, the concert would hold by 4.00pm on October 1, while Red Carpet would open by 3:25pm, adding that there would be no gate fee.